Gene Cernan was the commander of a manned mission that touched down on the moon's surface in December 1972. Harrison ("Jack") Schmitt accompanied him, becoming the first professional scientist to walk on the moon. Cernan and Schmitt lived for three days on the moon, using their small Lunar Module as a kind of tent on the ultimate geologist's field trip, while their crewmate Ron Evans waited for their return in the orbiting Command Module. Cernan was born on March 14, 1934 in Chicago, Illinois. At an early age he wanted to be an aviator, and joined the Navy to follow his dream. Cernan received his navy commission from the Reserve Officers Training Corps (ROTC) program at Purdue University in West Lafayette, Indiana, and immediately began flight training. He flew on Attack Squadrons 26 and 112 based at the Miramar, California, Naval Air Station, and then went to Naval Postgraduate School. In 1959 the United States selected the first seven of the pilots it called "astronauts"—who would fly higher and faster than anyone before them. This was in response to the unspoken challenge presented by the Soviet Union when it launched the world's first artificial satellite, Sputnik, in 1957, and the space race was on. Cernan, already a Navy pilot, was "fascinated," as he put it in his 1999 book, The Last Man on the Moon. "I had joined the Navy to fly, and the idea of riding a rocket ship into space had instant appeal. A new dream formed inside my crew-cut head." The opportunity Cernan had been waiting for dropped into his lap in 1963 in the form of a telephone call from a high ranking Navy officer asking if he would like to be considered as an astronaut for Apollo—the U.S. space program whose goal was to land a man on the moon. "There was a moment of silence on my end," Cernan recalled in his book, "while my heart jumped into my throat. I hadn't even applied. Last time I looked, I wasn't even qualified. But this guy was saying the Navy was recommending me to NASA for astronaut training. Was he talking to the right Lieutenant Cernan? It took a moment for the meaning of his question to sink in, then I came out of my fog and shot back with snappy military enthusiasm, 'Well, yes sir! Not only that, sir, but hell, yes! Sir!"' Cernan passed the National Aeronautics and Space Administration's (NASA's) strenuous tests and was officially selected as an astronaut in October 1963. Cernan's first space flight came in 1966, aboard Gemini 9. The Gemini program had been developed to test and prepare the hardware and skills in earth orbit needed to land people on the moon and return them safely. The Gemini space craft were two-man ships, and tiny. Cernan and his crewmate, Tom Stafford, spent three days in their capsule, orbiting 161 miles above the earth. While there, the astronauts perfected spacecraft rendezvous techniques that were later used on the moon flights. On this flight, Cernan became the second American, after Ed White, to leave a spacecraft while in flight on a space walk. Cernan's space walk, or extravehicular activity (EVA), lasted two hours and ten minutes. Cernan's next mission came in May 1969, when he flew as lunar module pilot on Apollo 10. This was the mission that preceded the flight that landed the first people on the moon, and it was only the second mission, after Apollo 8, to send people into lunar orbit. Apollo 10's purpose was to perform a full dress rehearsal for the first manned landing without actually touching down. In their lunar module Cernan, and his old crewmate Tom Stafford, descended to within eight miles of the lunar surface. The mission went smoothly except for a brief moment when the astronauts lost control of their ship, named Snoopy after the famous comic strip character by Charles M. Schulz. The command module was called Charlie Brown, also from Schulz's comic, and was piloted by John Young, who later commanded the first Space Shuttle mission. On the way down to the moon, at just 47,000 feet from the lunar surface, and hurling through space at some 3,000 miles per hour, the Apollo 10 lunar module went out of control for several very tense seconds when Cernan and Stafford mistakenly switched on the wrong guidance system. The spacecraft's computers became confused, and, as Cernan noted in The Last Man on the Moon, "all hell broke loose. Snoopy went nuts. We were suddenly bouncing, diving and spinning all over the place … The spacecraft radar that was supposed to be locking onto Charlie Brown had found a much larger target, the Moon, and was trying to fly in that direction instead of toward the orbiting command module." Finally, Stafford regained control by switching off the computers and flying the ship manually. "After analyzing the data," Cernan reported in his book, "experts later surmised that had we continued spinning for only two more seconds, Tom and I would have crashed. Things had been more than a little tense. Hell, I was scared to death. But we got back on track immediately." In spite of this potentially disastrous episode, the mission was a success, paving the way for Apollo 11, which landed the first men on the moon in July, 1969. "Apollo 10," said Cernan in his book, "had painted a big stripe right down the middle of the space highway that led from Cape Kennedy to the Sea of Tranquillity." In his book, Cernan responded to the question of whether he was disappointed that Apollo 10 did not make the first landing, thus rocketing him into the pages of history instead occupied by Neil Armstrong and Buzz Aldrin of Apollo 11: "Would I liked to have had a shot at it? You bet I would. However, we all believed in the importance of our mission because we knew Apollo 11 was going to need every scrap of information we could gather if it was to have a successful flight of its own. Our crew had the know-how, but not the right equipment because Snoopy was too heavy, and there were too many things still unknown about landing on the Moon before we made our flight. … Anyway, I had an idea—I planned to go back." Go back he did, on the last manned flight to the moon, Apollo 17. But not before another close call that almost cost him the mission—and his life. With just months to go before the final Apollo mission to the moon, Cernan took a small helicopter out over the Indian River near the Kennedy Space Center to practice moon landings. "After so many months of hard work and concentration," he said in his book, "I couldn't resist the temptation for a bit of mischief known among pilots as 'flat-hatting."' He flew too low to the water, and the machine crashed and exploded. Miraculously, he escaped serious injury, and remained on active flight status. Apollo 17 was launched on December 6, 1972. This was the first manned spacecraft to launch at night, and it returned to the earth on December 19, 1972. Cernan, the commander of the mission, flew to the lunar surface in the lunar module Challenger with geologist and lunar module pilot Harrison H. ("Jack") Schmitt. Ronald Evans awaited their return in lunar orbit aboard command module America. Challenger touched down at Taurus-Littrow, on the southeast edge of Mar Serenitatis. The moon was Cernan and Schmitt's home for more than three days. This mission marked the longest stay for people on the moon (301 hours and 51 minutes), and the largest amount of lunar material returned to Earth for study (249 pounds). Cernan described his first moments on the lunar surface in his book: "I slowly pivoted, trying to see everything, and was overwhelmed by the silent, majestic solitude. Not so much as a squirrel track to indicate any sort of life, not a green blade of grass to color the bland, stark beauty, not a cloud overhead, or the slightest hint of a brook or stream. But I felt comfortable, as if I belonged there. From where I stood on the floor of this beautiful mountain-ringed valley that seemed frozen in time, the looming massifs on either side were not menacing at all. It was as if they, too, had been awaiting the day when someone would come and take a walk in their valley." And, "As I stood in Sunshine on this barren world somewhere in the universe, looking up at the cobalt Earth immersed in infinite blackness, I knew science had met its match." Cernan stayed on with NASA after Apollo 17, although the mission was his last space flight. He worked as special assistant to the program manager of the Apollo spacecraft program at the Johnson Space Center, where he helped in the development of the Apollo-Soyuz project, which saw the first dockings of American and Russian spacecraft. He left NASA in 1976, and at the same time retired from the Navy with the rank of captain. His next venture was with Coral Petroleum, Inc., based in Houston, Texas. He served the company as executive vice president-international, helping to promote company business around the world. He started his own aerospace and energy consulting business in 1981, The Cernan Corporation. Also in the 1980s, he provided onscreen commentary for ABC-TV's coverage of the space shuttle launches. He subsequently became chairman of the board of Johnson Engineering Corporation, consulting with NASA on the development of space habitats. Cernan met his first wife, Barbara, in 1959. The two were married in 1961 and lived together until their 1980 separation. "She got tired of being Mrs. Astronaut," Cernan told CNN.com. In 1984 he met Jan Nanna, who became his second wife in 1987. 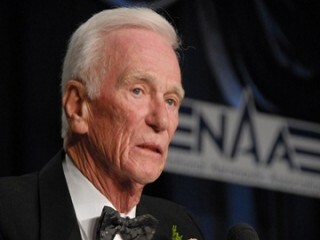 View the full website biography of Gene Cernan.